Following the success of the first edition, this Manual has been completely updated and reorganized to be even more practical and user-friendly. It follows reproductive medicine from mating, through conception and birth, looking at problems such as infertility and dystocia along the way. 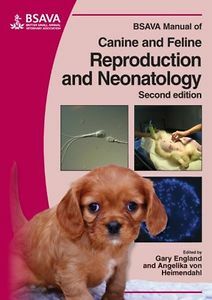 Care of the neonate plus conditions that may affect new puppies and kittens are also included. New developments in drugs and in biotechnology are discussed. Full colour photographs and illustrations support the text, which has been prepared by international contributors.